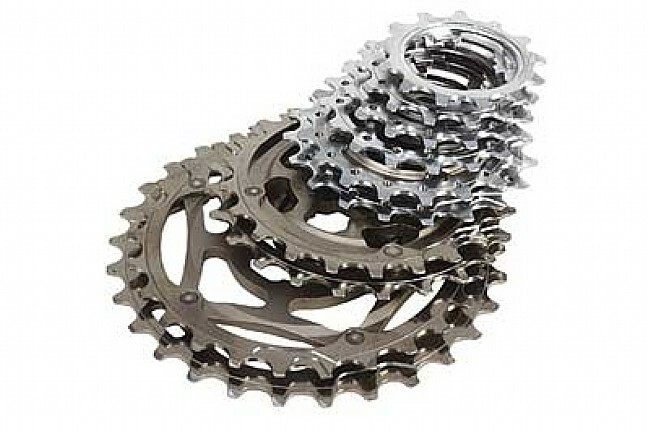 Campagnolo's Record UD 10-speed cassettes feature the Ultra-Drive system, where precisely machined and treated sprockets produce accurate shifting that's smooth as silk. Best of all, the Ultra-Drive system ensures perfect interaction between every drivetrain component, providing the highest level of performance in the most demanding race and weather conditions. The four largest cogs are titanium for additional weight savings. 188g (11-21). Lockrings come with 11-21, 11-23 and 11-25. Other sizes require separate lockrings. In stock, right price, great cassette replacing one that had lasted 70,000 miles-met my needs. With the prevalence of the in-style 11-speed cassettes it was great to find this replacement Campagnolo Record 10 speed cassette. It works great. I replaced the same existing cassette which had over 70,000 miles. When my bike shop mentioned the 11-speed grupos don't have the life durability of the 10-speed there was all the more reason to stick with my 10-speed grupo. It was great to find it at a good price. What's not to like - it's Campy Record! I've tried Shimano, still preferred Campagnolo. Then I heard all the hype about SRAM Red and tried it, still prefer Campagnolo. It may be expensive, but nothing I've tried shifts as well or lasts as long.